Serenity drifts softly past, like the clouds sweeping by the soaring mountains. Crackling logs from the fireplace cast a warm glow. Starlit nights enhance your experience in the soothing hot tub. Convenient to adventures yet secluded. When you need to get away, you need Peace of the Mountain. 3 Bedrooms and Two Baths: The first bedroom has a King Bed, a mountain view, and a TV. The second bedroom has a queen bed and a mountain view. The third bedroom has a bunk bed with a full bed over a full. There is a futon in the loft. The first bathroom has a shower stall only. The second bathroom has a tub and shower combination. 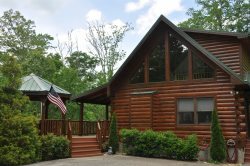 With an all wood interior, Peace of the Mountain is the authentic log cabin experience. The stone fireplace stretches to the lofted ceiling. Head up to the loft game room and enjoy a game of pool or air hockey on the combination table. The well equipped kitchen has a gas stove, and a griddle. Kick back in a rocking chair on the covered porch and savor the spectacular mountain view before you. The bubbling hot tub is the perfect spot for enjoying the pristine scenery. Lovely cabin amazing views!!!! Surely enjoyed our short visit! Loved that the cabin is very private and secluded. Bryson City was a BReath of Fresh Air. Loved the Small Hometown Feel. It's always friendly and efficient, never any problems. we truly enjoyed the beautiful cabin. We will definitely keep this place in mind for future vacations and getaways. Thank you for all the memories. All team members were very accommodating and pleasant to work with. Peace of the Mountain was perfect for a long Valentine's Day Weekend! All 4 of us went hiking Juneywhank Falls and Deep Creek Trail. Great short and easy trail for all. It was a great place to meet from Michigan, North Carolina, and South Carolina. This was a perfect cabin for a Valentines Day weekend. All 4 of us went hiking Juny Whank and Deer Creek Trail. These were great short and easy trail for all. IT was a great place to meet from Michigan, North and South Carolina. Wonderful experience.Very prompt returning calls and fixing minor problems. Thanks so much. Peace of the Mountain was exactly what we needed. It was perfect for our New Years Eve 2016 getaway. The view was breathtaking and sitting in the hot tub at nigh stargazing was one of my favorite parts of the trip!. Everything was perfect. Thanks again. Celebrating 30 years of marriage on this trip. We had a wonderful time. Thank you for sharing your cabin with us. The view to and the Xmas decorations were awesome! My Kids and the grand kids came for the weekend. It was there first time in Western North Carolina. The weather was strangely warm for December but we are not complaining. This is a beautiful cabin with a wonderful view!! Easy to find, but not too close to neighbors. The cabin was very clean and had everything we needed for a relaxing weekend in the mountains. The bunk beds were perfect for our 4 kids. We will definitely be back. This was a beautiful cabin. We were excited to see it decorated for Christmas. Loved the air hockey/pool table. This is just what life is all about peace of mind and being with family. We enjoyed our stay and will return. It was picture perfect upon arrival! Inside and outside beautifully for Christmas, What a warm welcome. We even got chased by Turkeys here on the mountain while exploring. We can't wait to come back. Peak Colors! Beautiful Views! We rode the train the gorge. The scenery was great. The cabin was perfect Thank you. What a view. This is exactly what we came for relaxing look out at an amazing view. The GSCR service is the best.